We’ve seen more and more wearable products recently, be it smartwaches, smart rings, fitness bands, etc.., and we can expect several announcements at CES 2014 for wearables. 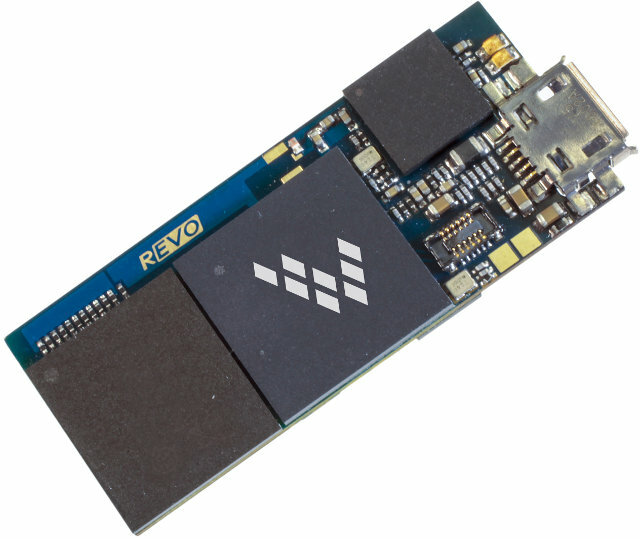 Freescale has just launched their Wearable Reference Platform (WaRP), comprised of the WaRPboard, a tiny board based on Freescale i.MX 6SoloLite running Android, and a daughter board with KL16 Cortex M0+ MCU and several sensors. Freescale i.MX 6SoloLite Cortex A9 processor @ 1GHz with 2D graphics Vivante GC355 and GC320 GPUs. KL16 Sub-Family General Purpose Cortex M0+ MCU. Xtrinsic FXOS8700CQ, 6-Axis Sensor with Integrated Linear Accelerometer and Magnetometer. Xtrinsic MMA955xL Intelligent Motion-Sensing Platform. It cane be programmed to provide freefall detection, tilt and 3-D orientation detection, tap and double tap detection, dead reckoning, shock, vibration and sudden motion detection and power management. The company expect WaRP to be used in devices such as sports monitors, smart glasses, activity trackers, smart watches and healthcare/medical applications. This will be a fully open source project with open source code and hardware. For some reasons, I could only find picture of the main board, but not the daughter board, and full technical details do not seem to be available right now. The wearables reference platform kit includes the main board (WaRPbard with i.MX6), a daughter card (with KL16 and sensors), an LCD display, a battery and a micro USB cable. The kit will become available in Q2 2014 for $149. You can register to the community www.WaRPboard.org if you are interested. Bluetooth 4.0 and Wi-Fi, Samsung LPDDR2 + eMMC single chip, and MIPI interface.